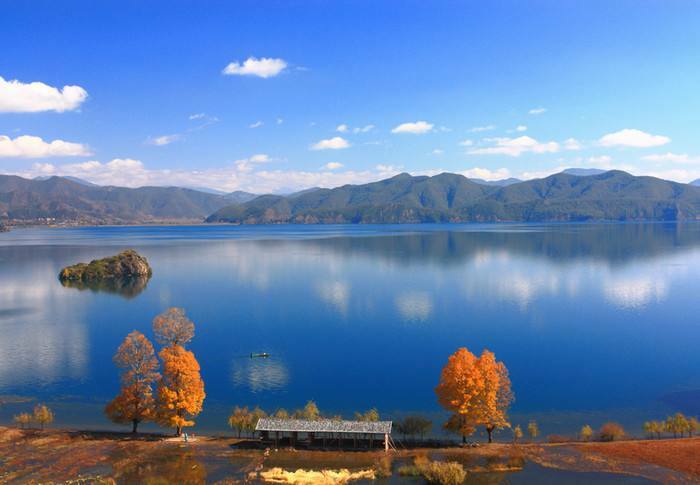 With an altitude of 2,685 meters, Lugu Lake covers an area of 50.1 square kilometers. The surrounding area is home to Mosuo, Yi and Pumi People. The water of the lake is edible without being sterilized. The lake is surrounded by several mountains among which Goddess Gem Mountain also known as Lion Mountain. The mountain is sacred to Mosuo People. Lying around 200 kilometers northeast of Lijiang, Lugu Lake offers a combination of natural beauty and customs of ethnic minorities. As several mountains lies around Lugu Lake, you will find many rare species of plants and animals on the mountains, such as Black-headed Gulls, Black-necked Cranes, Bar-headed Goose, Hill Pigeon, mountain sheep, elk, forest musk deer, Pallas's squirrel, grey-bellied tree squirrel, otter and the like. If you love mountaineering, it is recommended that you explore Goddess Gem Mountain. Mountaineering on the mountain requires the professional gear. If your body conditions don’t allow you to do that, you could take a chairlift at the foot of the mountain up to top of the mountain. After arriving at the top, you could climb some wooden stairs into the stunning cave. Locals always worship the Goddess Gem in the cave. The stones in the cave are a little slippery. The top of the mountain overlooks the breathtaking views of Lugu Lake. After admiring the landscape on the top, you will take a toboggan down to the foot of the mountain. You will see many wild monkeys on the mountain. Please do not feed them with food in case that they attack you. The staff on the mountain always feed them with food. Every lunar 25th of July, Muosuo people always worship the Goddess Gem on the mountain. If interested, you could enjoy boating on the lake and drink the sweet water at the heart of the lake. Or you could also enjoy cycling around the lake. The difficulty degree of cycling around the lake is medium. Several islets are located in the lake. Heiwa’e Islet at the heart of the lake is a habitat of migratory birds and wild ducks. In addition, you could experience the customs of Mosuo at one of the Mosuo villages around the lake. The “walking marriage” is based on mutual affection. Matriarchal families still remain at Mosuo villages around the lake. Mothers have the right to decide on anything in the family there. When one Mosuo lady gives birth to a baby, the baby will be raised by their mother’s family. If you are planning to visit Lugu Lake for photography purposes, the best time to visit is during the sunrise and the sunset. A few direct buses get to Lugu Lake from Lijiang. Therefore, you have a few options. Rent a vehicle to the lake. This is the quickest and most direct option. Take a direct bus at Lijiang Bus Station (丽江客运站), Yuhe Square CarPark (玉河广场停车场) at the entrance of the Old Town of Lijiang or Lijiang Gaokuai Bus Station (丽江高快客运站) to Daluoshui Village (大落水村) which is situated at the bank of Lugu Lake. Please take enough drinking water and food with you as the pricing in the scenic area is very high. Please take an umbrella with you to protect the sun or the rain from you. Please wear the sunscreen cream and sunglasses. Interested in visiting Lugu Lake on a Tour? Wendy Wei Tours offers a variety of different packaged tours as well as custom tours including Lugu Lake, among other attractions and destinations. To find out more, please visit our Tours page or Contact Us directly to find out more.